Nate Bourdain and his friends are thrilled to discover an ancient book of magic spells hidden in their school library--they now have the means to stand up to the villains who make high-school life such a battle. But, when the book's dark magic releases a fictional killer into the real world, the teens must prove they have what it takes to be heroes, or fall as bloody victims in their own horror story turned real. 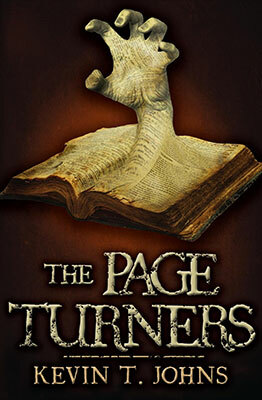 The Page Turners is one of those novels I almost dropped during the first chapter and I’m glad I didn’t. The introduction consists of a two-page extract of a fictive heroic-fantasy novel which entirely failed to catch my interest. Then, the first chapter was all about high school drama, with nerds being bullied by a Back-To-The-Future-Biff-like brute, social embarrassment with girls and hearing-but-not-listening teachers. However, two things kept me reading: first is Kevin T. Johns’s elegant and thoughtful writing. I especially enjoyed how the author brought bullying or orphanhood in the story and talk about it in a not-pitying way. Second was the strong and detailed character development. Danny couldn’t help but laugh at himself. It is truly amazing, the demons we are able to conjure up out of practically nothing at all. In the night, it takes barely any magic at all to transform a wisp of air into the spectre’s murmur”. The strength of The Page Turners lies in its characters. The story follows three kids of very different backgrounds in a small town called MapleWright, which is vividly depicted. Nate, Spenser and Danny all have far-from-perfect families who feel more like a challenge than a support. They all have their individual fears and weaknesses and struggles to overcome them. They are trying to find their place in the world and assert some of their talent or authority… but they are, for the moment, only known as the school nerd pack. All they have is their friendship and the book club they created, called “The Page Turners”. One day, Nate finds a mysterious book in the library. It looks like an old, genuine spell book. Without thinking much of it, the three friends read out loud the only page written in English. Nothing happens. At first. And then… disaster falls on MapleWright. When they say “the body”, it means the person you knew is no longer your mother, no longer your friend. Now it’s just the body. In that instant, people are transformed from vibrant and complex human beings into corpses, things that have to be dealt with by those left behind. While this happens, the three kids are almost the only people in town to know about it. The plot is rather typical in the sense that the boys will investigate, won’t ever be taken seriously, and finally decide to face a great danger by themselves. In doing so, they will discover the power of real friendship and their inner strength, which they had never believed in until then. It’s a coming of age, the hard way. The house frowned back at them. Its dark window glared down on them like the black-green eyes of a corpse. The roof was a scraped and scabby scalp, and the front door an entranceway to a bleak and cavernous mouth filled with rotten teeth and oozing gums. The house of death whispered tales of blood and pain, daring them to enter its unholy dominion. While the story is captivating, I was a bit disappointed by the lack of originality in the plot. It’s beautifully written, well executed and efficient, but it’s nothing new. Kids are facing a monster in a small town, and the monster itself is pretty typical. I would have liked more fresh ideas. Also, I have a particular complaint about the only female character worth mentioning in the novel, a twelve years old whose biggest achievement in the book is to have overcome her first menstruation. All the drama and dialogues related to her period didn’t sound right to me (from her “humiliation” to her “new self-confidence”). However, The Page Turners was enjoyable. It’s well written, well-paced, and the characters are highly likeable. It did remind me a bit of It by Stephen King: the horror falling on a small city and the group of kids trying to fight it. While I would rather recommend this book to young adults, it can also be read by adults as a safe introduction to horror literature, since it’s slightly-gory-but-not-so-scary. Also, The Page Turners is the first opus of a trilogy, as MapleWright hides more mysteries that might have impacted the boys’ life earlier. I certainly can’t wait to read the next book!